When it comes to finding the right small sedan for the daily commute or other adventuring needs, there are plenty of options on the road. 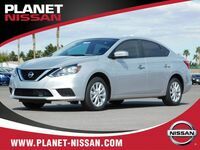 However, in a sea of vehicles that offer acceptable technology and comfort, the 2019 Nissan Sentra in Las Vegas NV brings that to the next level. This elegant sedan delivers a spacious interior that can please all five passengers. The trunk has 15.1 cubic feet for cargo, while even rear seat passengers can enjoy 37. 4 inches of leg room. Powered accessories, air conditioning, a standard rearview camera and a tilt-and-telescoping steering wheel are standard features. Whether busy shoppers choose the S, SV, SR, SR Turbo, SL or NISMO trim levels, they can enjoy confident driving and features. New for 2019, Apple CarPlay and Android Auto smartphone connectivity will come standard on all but the base trim of the Nissan Sentra. Most models of the 2019 Nissan Sentra in Las Vegas NV will come with a 1.8-liter four-cylinder engine. When mated to a six-speed manual transmission on the 2019 Nissan Sentra S, this model offers 130 horsepower and 128 pound-feet of torque. On most other models with the Xtronic transmission, the engine output changes to 124 horsepower and 125 pound-feet of torque. SR Turbo and Sentra NISMO models come with a turbocharged 1.6-liter four-cylinder that offers 188 horsepower and 177 pound-feet of torque. Drivers more interested in safety and convenience features will be able to find plentiful technology options on the 2019 Nissan Sentra. This compact vehicle is available with several advanced Nissan Safety Shield features including automatic emergency braking, adaptive cruise control, blind spot warnings and rear cross traffic alerts. Comfort features also abound in the 2019 Nissan Sentra, which can make the daily commute enjoyable even as the Sentra’s fuel economy helps keep costs down. Some available feature highlights on this model include a leather-wrapped steering wheel, sliding front arm rests, a moonroof, leather seating, a six-way powered driver’s seat with lumbar support, and an eight-speaker sound system from Bose. 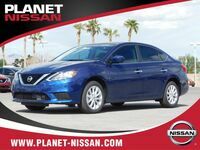 Would you like to know more about the 2019 Nissan Sentra currently available in Las Vegas NV? 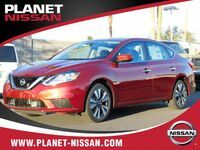 Request more information from us here at Planet Nissan by clicking below, or visit our dealership in person at 5850 Centennial Center Boulevard.